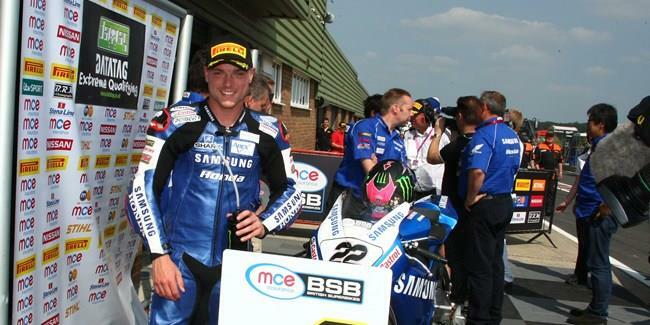 Samsung Honda’s Alex Lowes set the fastest ever lap seen around the Snetterton 300 circuit to claim pole position - his third of the season - for the fifth round of the MCE British Superbike Championship. Fastest in free practice by just 0.02s from current championship leader Shane Byrne, Lowes went quicker still in the final stages of qualifying and a lap of 1m48.106s gave him a 0.387s advantage over Byrne. The Rapid Solicitor’s Kawasaki riders bid for pole was thwarted by a slower rider but he was happy with his front row position, just ahead of Josh Brookes. The Tyco Suzuki rider was slightly disappointed not to have gone as quick as what he’d done 12 months ago and he was joined on the front row by Ryuichi Kiyonari on the second Samsung Honda, the former champion’s resurgence continuing. James Ellison was the lead Milwaukee Yamaha in fifth with the evergreen Chris Walker continuing his fine form in sixth. Tommy Bridewell, Jakub Smrz and the Buildbase BMW pairing of Jon Kirkham and James Westmoreland completed the top ten, Kirkham bouncing back from two spills.